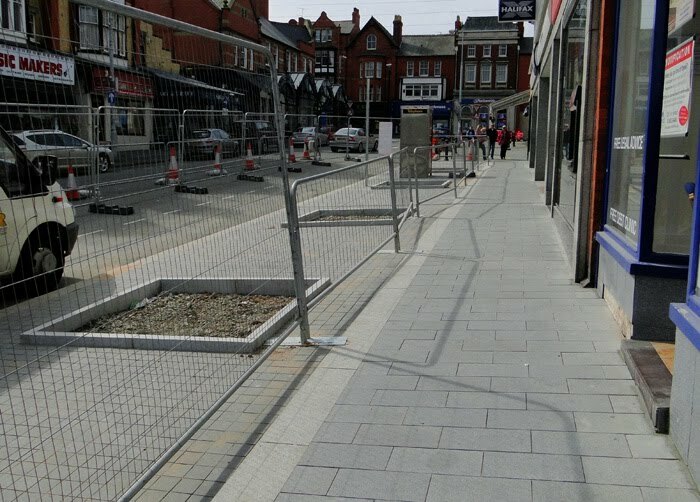 I was pleased to see that the ongoing refurbishment of Penrhyn Road in Colwyn Bay appears to be a lot more successful than the previous attempts in both Sea View Road and Station Road. 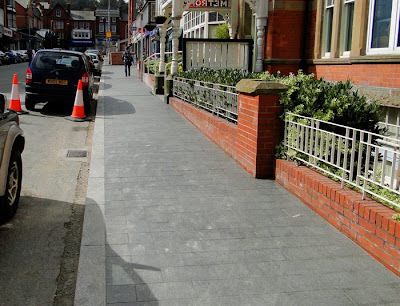 Although the same grey paving has been used, it has been limited just to the pavement areas (with the road area being resurfaced in tarmac) and the smaller area of usage looks far more acceptable. There also appears to be far more in the way of tree planting planned. Of course, the main advantage over the Station Road scheme is that traffic will continue to be able to use Penrhyn Road, creating a far busier environment - if only the planners had listened to local people/traders and reopened Station Road to limited traffic with parking down one side, it would have been far better. Speaking of Station Road, the paving used there seems to getting very dirty already, any liquids spilt seems to stain large areas of the paving. After only a few months, it is starting to look rather tatty, sadly. Wow! more cheap grey paying slabs imported from halfway around the world... I'm sure national retailers will be flocking to fill Penryhn Road now, just like they have in Station Road / Seaview Road? - I mean, you can hardly move in Colwyn Bay for exciting new retailers, can you? There was talk of extending the market into Penryhn Road at one point - don't know if this is still on the cards? - I guess it is to enable the new slabs to quickly get covered in black oil stains from transit vans, so they match Station Road? Have you noticed how cracked some of the slabs in Llandudno are? Awful and sad for such a great town.